NYSE listed stocks must open and close on a balanced print. All orders to buy or sell a security at the open or close must meet at a price determined by manual auction. Imbalances in buy and sell orders for the open and close of each trading day are published to market participants to facilitate trade. This is what the NYSE feels is the most transparent and efficient way to auction a security to the correct price at the open and close of the trading session. Many traders are either not aware of these numbers or do not have access to them, putting them at a big disadvantage. I will be posting a quote of the NYSE imbalances for the NYSE listed OEX index stocks everyday on Twitter, StockTwits and Stock.ly. I convert the share number imbalances into dollar-terms so that it is more understandable. I’ll do my best to consistently post the closing imbalances. 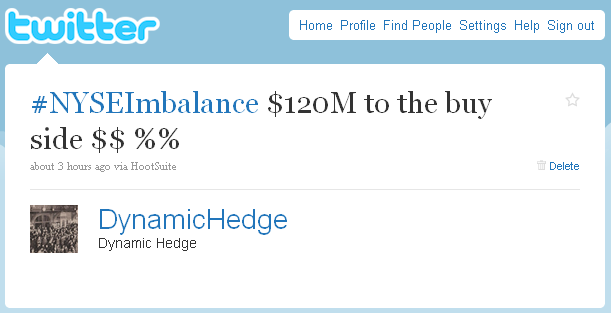 I will not post the opening imbalances on a regular basis. Click the Twitter link in the right column to follow these updates. Before the opening bell, market and limit orders are sent to the exchange to be filled on the open. These opening orders are then crossed on the opening print based on supply-demand. The Opening Imbalance is the difference between number of shares in these buy and sell orders. Over the course of the trading session market orders and limit orders are sent to the the exchange to be filled on the close. These closing orders are then crossed and filled on the closing print based on supply-demand. The difference between the number of shares to buy and sell is published at 3:45 ET as the Closing Imbalance. Imbalances can spur the security to auction to a higher or lower price to balance out supply and demand. Often times, other market participants see the imbalance and place offsetting orders that immediately reduce the imbalance and the need to auction the price of the security higher or lower. In the above example, there are $120 Million more shares on the buy side than the sell side of roughly 70 large cap stocks (The approximate numbers were: $150 Million to buy, $30 Million to sell). It’s important to remember that by the close of the day, regardless of the size of imbalance, all imbalances will be offset and crossed. The closing imbalance number represents a snapshot of the supply-demand relationship at the moment they are published (3:45 ET). Imbalances are rolling and change based on the supply-demand relationship. I’ve seen big imbalances flip from a buy-side imbalance to a sell-side imbalance and vice versa. These numbers are available to most professional traders and are heavily gamed by many market participants. There is an art to interpreting and using these numbers in your trading. Imbalance rules are subject to NYSE Rule 123C and are amended from time-to-time. Check with the NYSE website for more details.